Little Tikes Dunk N’ Toss Bouncer Just $112.58! Here is a great price on a super cool product! Grab the Little Tikes Dunk N’ Toss Bouncer for just $112.58! 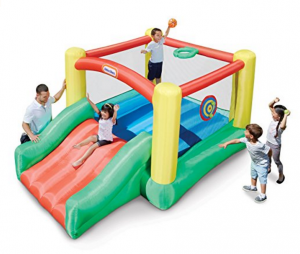 (regularly $199.99) This 7′ X 7′ bouncer features a basketball hoop, target, and slide for hours of fun. To compare, this on sale for $138.27 at Walmart, which makes this price point awesome! Keep in mind, Amazon pricing can change at any time! Don’t wait to purchase this deal or it might be gone when you come back! Inflatable 7’ x 7’ bouncer with a basketball hoop for tons of backyard fun! Plus, it will ship free for everyone, yay!